Where '70s tough-guy actors were concerned, John Saxon couldn't be beat for versatility. During the decade, the actor played equal amounts of leading and supporting parts, as both heroes and villains in a bevy of different countries, as a bevy of different ethnicities. But when Saxon made an incredibly prolific burst of 1976-1977 Eurocrime movies, the roles were a lot more lopsided towards villains and supporting parts –- you need only take a look at his nefarious criminal characters in Violent Naples, Mark Strikes Again, Special Cop in Action, The Swiss Conspiracy and The Cynic, the Rat and the Fist. Although occasionally he would play a good guy (Blazing Magnums), only once did he play a heroic lead during his Eurocrime phase, in Cross Shot. Cross Shot is yet another Dirty Harry inspired Italian cop movie about an angry-at-the-system police detective, but the script doesn't give Saxon much of a twist on this cinematic archetype, except an unusual, even for Eurocrime, penchant for excessive force, at one point pummeling a kid for breaking into a cigarette machine. 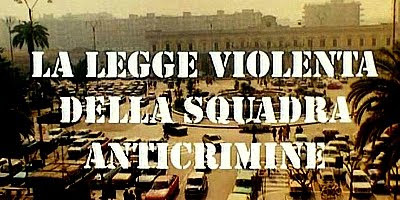 But the biggest twist that Cross Shot offers on the Italian angry-cop formula is that here the cop is not butting heads with his police superiors but rather the local newspaperman. Otherwise, all the genre staples are trotted out, from the hostage getting dumped from a moving car, see also Crime Boss, Violent Rome, Special Cop in Action, etc, to the blind kingpin character, see also Syndicate Sadists.